Colleagues and roommates aren't the only ones who use passive aggressive language to send a message to those that annoy them. Bored Panda has compiled a list of the most brilliant ways people told their neighbors they were being a**holes, and they will definitely give you some ideas on handling residential disputes. I mean, you can only live next to a wannabe-drummer or a pile of garbage for so long, right? From asking the neighbors to quit dropping cigarette butts on the ground to reminding them that your yard isn't a dog toilet, the people behind these messages would probably graduate from Anger Management University with an A+ in all of their curricula. Scroll down to check them out and upvote your favorites. These neighbors are real good artists ! ohhh. thats why cats go out at night huh? This angers me so much, as it happens sooooo often. I have several disabled friends who can all tell stories about something similar happening to them. One of them uses a wheelchair, but also drives a sports car and regularly has people stop, ready to harangue him while he parks his car, only to scamper off embarrassed when he gets his chair out. Your neighbor knows nothing (about dogs). Is he Jon Snow? Applause !! Savagery at its finest ! Haha, that might actually work a lot better than an angry note! I need this sign in my neighborhood. And that couple's grandson! I have a couple of people that seem to think their small dog's crap will vanish when it hits the lawn or sidewalk. I put up a camera in the front of the house, but I think I might have to steal this idea and add "I'll send my boxer dog to poop on your porch!" ahahah! It remind me the story of a guy who named his network "hack me if you can"... the next day, his network was renamed "challenge accepted"
Where the hell do people come off telling others what to do with their gardens?? #15 One Of My Neighbors Put This Sign Up. Bravo! Acceptable. They pay for it, they can use it. They could also rent it out to someone who has a car and no spot. Win-win. 12 hours!? Who leaves a dog alone in 12 hours? Anyways, great flyer! I hate people who report before just talking to their neighbor. If they would have just asked, these people might have put them behind a barrier and things would be fine. Now you have angry neighbors and things tend to escalate quickly. I despise people like that. #29 Does Your Cat Have A Death Wish? That's a good person! People shouldn't let their cats run free, period, but definitely not cats like this. If it gets killed, I'm sure they'll be all over the unfortunate driver who couldn't even help it. #30 Think This Will Solve The Problem? Extra points for correct use of "you're"
That is so weird. Why would you go to the trouble (and disgust) of picking it up and than throw it away again with bag and all? #33 Hey Neighbour, Happy New Year! A kid that plays with brooms...? Wow, someone actually took the time to make the Potato Clan !!!! Wait...they called the police on your lawn? What crime could your lawn possibly commit that would warrant the cops? I work at a window tinting company. This wouldn't work unless they used actual mirrors. Oh FFS how petty are they? That's not passive-aggressive, that's actually very friendly and considerate. Hope you did as asked. I sang along! Best note ever! That's just being really horrible... And if someone has that attitude, I wonder how good a neighbour he is? #48 Out: Pink Flamingos. In: Headstones? 😅 I'll have to use this! I couldn't do this...The thought of looking out of the window and only seeing half the wall cleaned, would drive me insane, so for the sake of what sanity I have left and just to make the entrance to my home look nicer, I'd clean all the front wall. Something similar happened to my mom. The downstairs neighbor left her an outright agressive note on the door accusing her of moving furniture every morning between 6 and 7 am and threatening to call the cops. My mom is 62 years old and tiny and has no intention of moving furniture around for sport. The ones moving crap around were the neighbors above HER apartment! 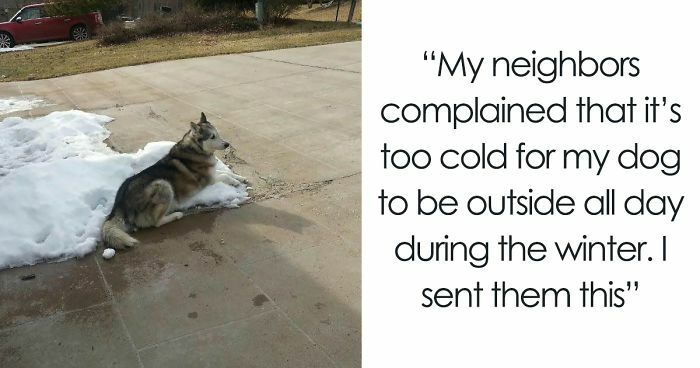 That happens to me every other night in summer (that my neighbors are loud, not that I get those messages). But I have neither the energy nor the humor to do something like that. I'm just frustrated and physically ill from not getting enough sleep. Who drags bulky furniture across the floor every single day and night?? Remember those people who covered the College goers's cars with a few feet of snow in that other post? #63 A Little Less “Deck The Halls,” A Little More “Silent Night”? *singing* before you came into my life I could park my car, i could park my car, withou the frustration! I've been in both situations... where nosy kids interrupt my rest and where MY kid interrupt other's, and frankly, it's life... some times my 1YO kid wakes up too early crying his lungs out and there's nothing I can do to avoid it, just try to calm him down as soon as possible (cause I want to go back to sleep aswell). I understand my neighbors get annoyed by this but, there are two options, move out or understand that these things happen. Once, one lady neighbor even knocked my door offering her help and asking if everything was fine with my kid, that was a nice gesture from her and, I think, one of the best ways to approach this kind of situations.